Both Jeff and Talmida have posts on atonement, so I thought I'd do something also. I don't care for the idea of atonement, but if I had to choose a certain theory of it, I might choose the one sometimes called Christus Victor, perhaps the first existing theory of atonement. As I mentioned in a past post, this view, basically the Eastern Orthodox view, is held and dicussed by David Bentley Hart in his book The Beauty of the Infinite, under the heading A Gift Exceeding Every Debt. 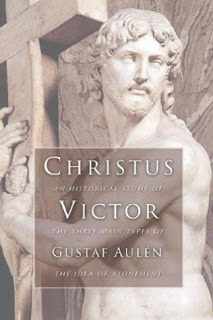 The term Christus Victor comes from the title of Gustaf Aulén's groundbreaking book first published in 1931 where he drew attention back to this classical early church's understanding of the Atonement. In it Aulén identifies three main types of Atonement Theories: The "Latin" or "objective" view, more commonly known as Satisfaction Theory beginning with Anselmian Satisfaction and later developing in the Protestant Church into Penal Substitution; secondly the "subjective" view commonly known as the Moral Influence view and credited to Abelard; and finally what Aulen called the "classical" view of the Atonement more commonly known as Ransom Theory or after Aulén's work now called the "Christus Victor" theory of the Atonement. Even here, then, in the text that most notoriously expounds the sacrificial logic of atonement, the idea of sacrifice is subverted from within: as the story of Christ's sacrifice belongs not to an ecomony of credit and exchange but to the trinitarian motion of love, it is given entirely as gift - a gift given when it should not have needed to be given again, by God, at a price that we imposed upon him .... the primordiality of the gift is the truth of Christ's paschal donation: the gift God gives in creation continues to be given again, ever more fully, in defiance of all rejection, economy, violence, and indifference; there is no division between justice and mercy in God, on Anselm's account, because both belong already to the giving of the gift - which precedes, exceeds, and annuls all debt. If Christus Victor was normative for the first 1,000 years of Christendom, I don't see what's wrong with holding to it. Looks like it has good ecumenical possibilities to me, at least with the EO. Interesting thing... When I was a kid studying the Baltimore Catechism in the 1960s, the sisters would tell us that Jesus died to "open the Gates of Heaven", which had been closed to all of mankind due to Original Sin. We were told how the Apostles Creed teaches us that Jesus descended into hell to free Moses, Abraham, the prophets, patriarchs, and other holy men and women who hadn't yet been able to go to heaven. There was nothing like the notion that Jesus had died to cover our personal sins, like it is commonly understood in the evangelical sense (our sins were still very much our own sins according to the sisters!!). We were told that through his sacrifice, Jesus merited superabundant grace that was shared with us in the sacramental life of the Church, particularly though penance and the Eucharist, which allowed us to live in Christ and to be in one body with Him. When I look back on that, it does seem to sound more to me like a Christus Victor view rather than an Anselmian view. it's interesting that you mention the harrowing of hell. Fr. Marsh has a link on his blog to a peper he wrote that touches on the Christus Victor theory of atonement and also Hans Urs von Balthasar's writings on Jesus' harrwing of hel ... really interesting. It's here. Christus Victor was not nearly as common as Aulen claims it was. Read, for example, the Epistle to Diognetus where the second-century author teaches a penal, substitutionary interpretation of the atonement. Examples of this sort could be multiplied. Aulen overstated his thesis, and, at times, misrepresented historical sources. God's goodness makes us worthy through the atonement of Christ: "A ransom for us, the holy one for the lawless, the guiltless for the guilty, `the just for the unjust,' the incorruptible for the corruptible, the immortal for the mortal. For what else but his righteousness could have covered our sins?" (9.2-3). This sounds like the Orthodox ransom theory of atonement, which Aulen calls the classical theory? While I am open to the idea that Aulen erred by pitting these models of Atonement against each other so sharply, I am not so easily convinced that he is wrong in seeing a major change in teaching in Anselm, even if Anselm still more continuity with the classic view than many expect. I do wonder, though, how much weight ought to be given to a document like the Epistle to Diognetus. If we want to know what most people would be familiar with, I would think hymns and catechisms would be the kinds of sources that would be most helpful, even moreso than church fathers. The question is not merely of when something was written, but how much influence it had. An apologist will often frame his case using elements he thinks will hold up best to counterargument, rather than the ones most commonly found in-house.